A combination heater and defroster core and housing is mounted low on the right side of the cowl between the cowl side panel and the right front fender. This high capacity core serves both the 1958 Buick heater and defroster systems which differ only in distribution of the heated air. An additional tube and fin radiant heating element is located under the front seat to provide additional rear floor heat. 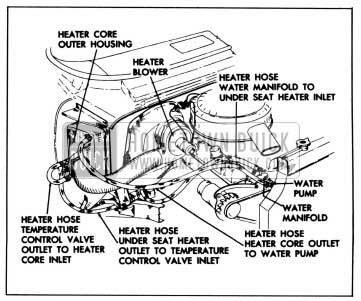 Hot water is supplied to 1958 Buick heater-defroster core through the 1958 Buick underseat heater, the temperature control valve and the thermostat housing in the engine water manifold. It enters the bottom of the heater-defroster core and leaves at the top where it is conducted through a hose directly back to enter the suction side of the engine water pump. The blower located on the engine side of the right ventilator air duct cover, draws outside air through the cowl air intake screen and into the right air duct. The air is then forced from the blower into an air tube which delivers it to the 1958 Buick heater-defroster core. The air flows through the heater-defroster core into the inner heater and defroster core housing where it may be directed into either the 1958 Buick heater or defroster distribution system by means of two fly valves. For heating, the air is directed through the heater air distribution system to three heater outlets. One is located at each end of the instrument panel and the third outlet is located below and behind the center of the instrument panel. See figure 11-9. The 1958 Buick heater-defroster system uses only outside air. However, when an air conditioner is installed, some interior air is recirculated. For defrosting, the air is directed from the inner heater-defroster core housing through a 1958 Buick defroster air hose to two wide defroster outlets at the windshield. All the air may be directed through either the heating or the defrosting distribution system, or the air may be partially directed through both depending on the position of the two valves. See figure 11-9. Two ventilation air vents are located on the lower dash panel, one on each side of the front compartment. The valves incorporated in these vents are controlled by two push-pull control knobs located on each side of the steering column on the lower instrument panel. 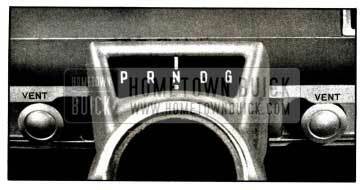 The hot water flows from the engine water manifold through a hose into the 1958 Buick underseat heater. The water flows from left to right through this unit and out the return hose into the bottom of the 1958 Buick heater temperature control valve which is located inside the heater inner housing. From the _ control valve, the water flows through a hose to the bottom of the heater-defroster core, out at the top through a hose directly to the suction side of the water pump. See Figure 11-11. The system is equipped with 3/4″ I.D. hoses and 3/4″ heater temperature control valve. The temperature control valve is located on the right cowl side panel where it is housed under the heater inner housing. 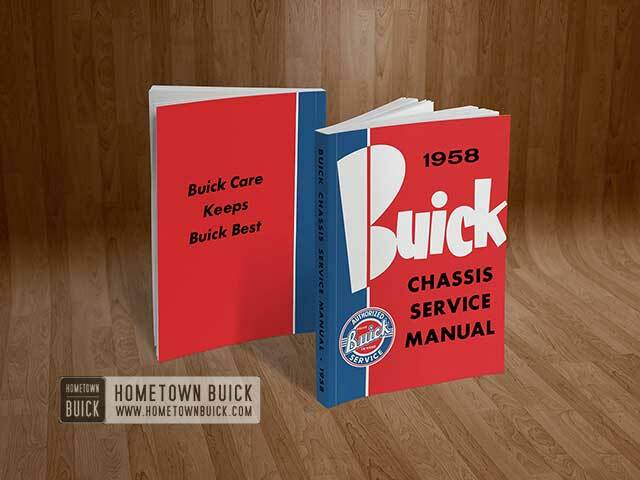 The 1958 Buick heater temperature control valve controls the temperature of the heater air entering the passenger compartment by regulating the flow of hot water through the heater and defroster system. This flow of hot water is regulated automatically by the signal from a capillary tube stretched across the inner side of the 1958 Buick heater-defroster core. As a result, for any selected setting of the heat range control, relatively constant heater air temperature will be maintained at all car speeds. A “jiggle pin” in the bleed hole of the engine thermostat allows air to escape through the bleed hole when filling the system, but seats, closing off the bleed hole when the water pump creates a small amount of pressure, thereby resulting in more rapid engine water and heater warm-up. Disconnect water hose from 1958 Buick heater core inlet. IMPORTANT: Steps 2-6 are performed from inside the driver’s compartment. Remove button from inner heater housing and disconnect control cable from temperature control valve. Remove the cable from housing. Remove inner heater housing retaining screws and move housing away from opening in side panel. Remove 3 screws retaining 1958 Buick heater core outer housing and slide assembly away and down from opening in side panel. Reaching through opening in side panel, disconnect heater inlet and outlet hoses from temperature control valve. Disconnect and carefully disengage temperature control valve from cowl side panel. Connect operating wire to control lever and clamp end of sheath approximately 1/8″ from edge of clamp on lever support. Move lever to within 1/16″ of extreme “OFF” position. Turn temperature control valve all the way clockwise until the cam locks against the roller. This is the extreme “off” position. Connect operating wire to brass post on valve and clamp the sheath to valve assembly. Operate the control lever through full range to make certain that the valve provides the stop at both ends. 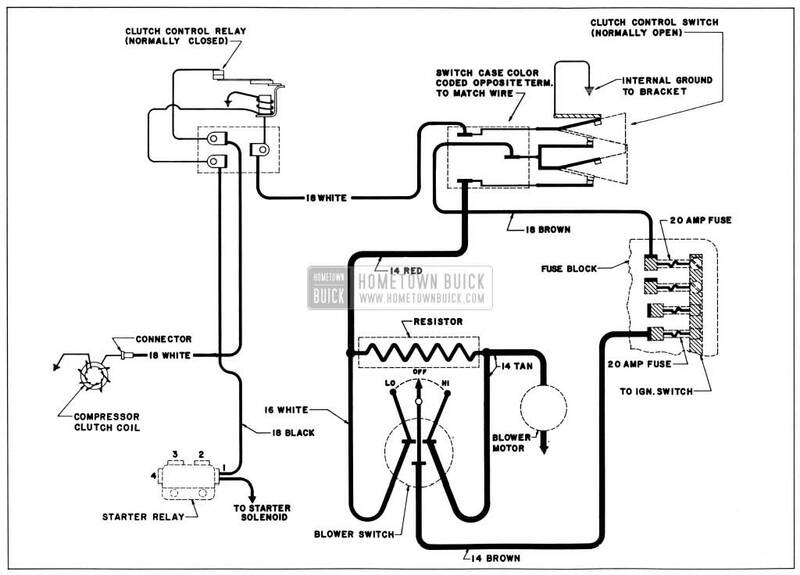 Figure 11-13 shows the control panel which is used with the 1958 Buick heater and defroster installation. Figure 11-22 shows the control panel used with the air conditioner installation. Although the controls are positioned slightly different when an air conditioner is installed, the controls operate in the same manner as they do when only the 1958 Buick heater and defroster are installed. The 1958 Buick heater and defroster air control is of the airplane type and the control lever is attached to fly valves in the inner heater and defroster core housing by means of a control wire. When the knob is pulled half-way down the defroster valve opens and allows air to flow into the defroster distribution air hose. 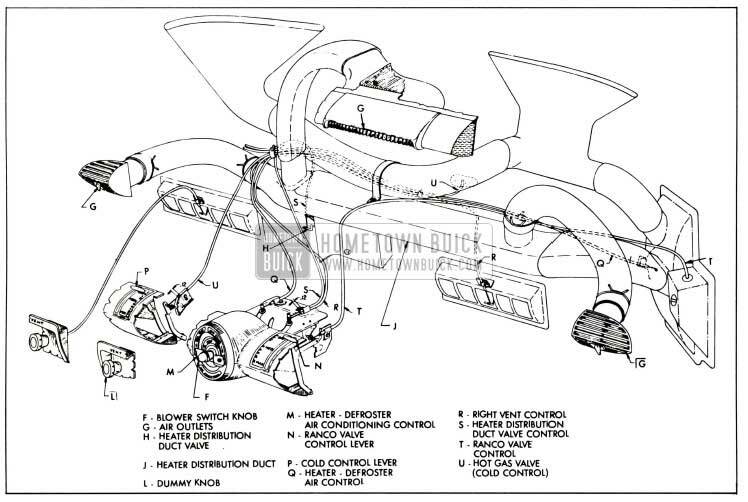 Figure 11-22 shows the location of the heater and defroster control on an air conditioner equipped car. 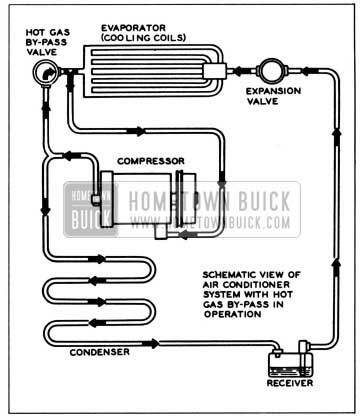 When the 1958 Buick heater and defroster air control, as shown in figure 11-13, is moved to the bottom position it opens the heater valve in the inner heater and defroster core housing and allows air to flow into the heater air distribution system. 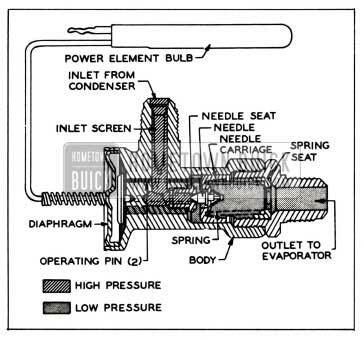 At the same time the 1958 Buick defroster air valve is closed. Because the defroster valve closes as the 1958 Buick heater valve is opened, a condition of both defrosting and heating can be obtained when the air control valve is at its mid-position. The blower speed is controlled by a rotary switch located in the center of the control panel. See figures 11-13 and 11-22. The switch has 3 positions, “Hi,” “Off,” and “Lo.” The heater temperature control lever, as shown in figures 11-13 and 11-22 regulates the temperature of the 1958 Buick heater air entering the passenger compartment and is connected to the Ranco valve by a control wire. As the temperature control lever is moved from top to bottom the heater discharging air temperature is increased. 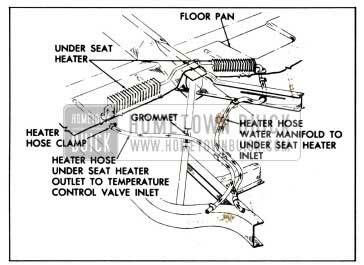 The 1958 Buick heater and defroster valves located in the inner heater and defroster core housing are operated by a cam type linkage which is designed to prevent valve flutter noise. See figure 11-12. NOTE: To keep out offensive traffic odors and exhaust gases when traveling in congested traffic or when parked behind a car having its engine running, all ventilator and defroster valves must be closed and the blower must be turned off. A radiant underseat heater of the tube and fin type is located under the front seat. This unit is piped in series with the main heater core and will warm the air flowing to the rear seat by means of the center heater outlet. From under car, disconnect inlet and outlet heater hoses from 1958 Buick underseat heater. Remove 5 screws that hold heater to floor pan, 2 screws from each end and 1 at center. Carefully disengage 1958 Buick heater from floor pan. Avoid inhaling exhaust gases when any concentration of these is present in the air, i.e., in a garage, in congested traffic, or when stopped closely behind a vehicle with its motor running. Exhaust gases may have strong odors which normally should give warning of their presence. However, the exhaust gases from some vehicles may not be noticeable under certain conditions and the senses of people react differently. Exhaust gases contain a percentage of carbon monoxide, which is a poisonous gas that, by itself, is tasteless, colorless, and odorless. The 1958 Buick Air Conditioner is dash-mounted with all the components located in or ahead of the dash. The compressor and condenser are located as shown in figure 11-15. The receiver-dehydrator tank is vertically mounted along the right side of the condenser. The evaporator with its case and blower are mounted forward of the dash panel on the right side. All units are joined with high pressure hoses provided with double flare fittings. Units provided for field installation come already connected together and charged with 5 pounds of Freon 12, and are installed as a unit without breaking any of the connections. The air conditioner uses the same air distribution system as the 1958 Buick heater with an additional outlet at rear edge of the upper instrument panel. Locations of the various units of the 1958 Buick Air Conditioner system and their connecting hoses are shown in figure 11-15. Figure 11-39 shows the electrical control circuit, which is entirely separate from all other chassis and body wiring. Any service work that requires breaking a pipe joint or hose connection should be performed only by mechanics who have been trained in Buick or other automotive air conditioning schools. Whenever a hose is disconnected from any unit refrigerant will escape unless the proper procedure is used. Any work involving the handling of refrigerants requires special equipment and a knowledge of its proper use. Compressor and Clutch. The axial piston type compressor is mounted on the right-front of the engine, over the generator. The compressor to engine speed ratio is approximately 1.25 to 1. 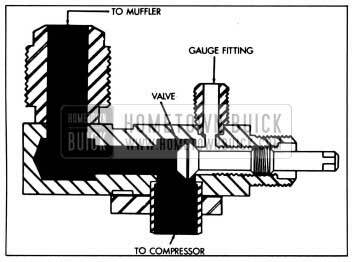 The 1958 Buick mufflers are located in each compressor attaching line, one in the suction line and one in the discharge line. They consist of cylinders approximately 2 1/2″ in diameter by 3″ long containing interior baffles that greately reduce the characteristic pumping sounds of the compressor. The main shaft seal seat is located ahead of the seal body. 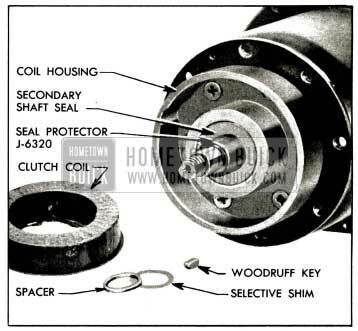 The clutch hub is retained to the main shaft by a woodruff key and a press fit. The pulley bearing is also a press fit to the shaft and is retained in the pulley by a snap ring. See Figure 11-16. 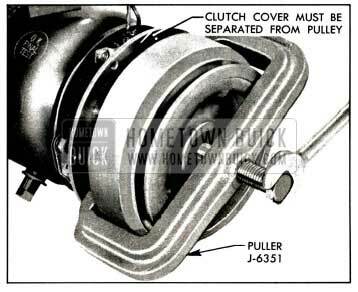 The 1958 Buick Air Conditioner compressor clutch is actuated by an electro-magnetic coil housed between the clutch and pulley assembly and the compressor housing. Two dry disk clutch plates, separated by three nylon balls, are used. Each plate has a flat ring of frictional material bonded to its contact face. The forward clutch plate is fixed to the compressor main shaft by a woodruff key and press fit. 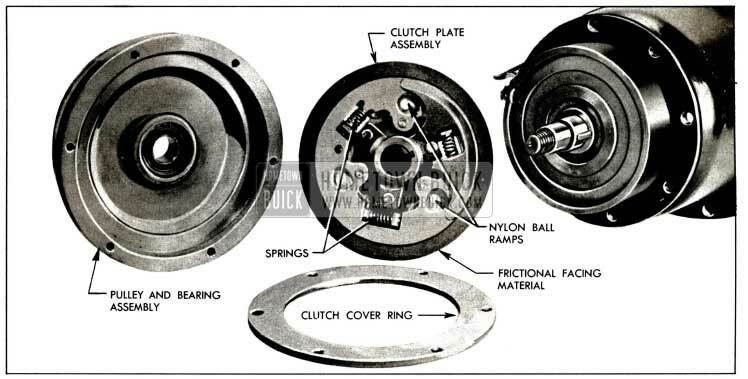 The clutch plates are connected to each other only through three small coil springs positioned to oppose the torsion of the driving force. When the coil is energized a magnetic field is created which attracts the rear clutch plate and pulls it into contact with the clutch cover ring. The frictional forces overcome the three torsion springs (See figure 11-17) and cause enough relative rotation between the clutch plates to make the nylon balls roll up their ramps, spreading the clutch plates apart and forcing them into firm contact with their mating surfaces. 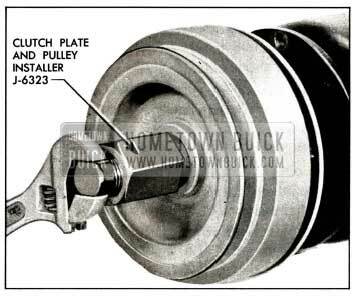 This provides a solid connection between the pulley and the compressor main shaft. When the clutch coil is de-energized, the magnetic field collapses and the rear clutch plate is no longer held against the clutch cover ring. The three coil springs overcome the servo-action of the nylon balls and force the clutch plates into a neutral position, disengaging the pulley from the main shaft. The oil checking fitting is a fitting similar to a brake bleeding screw. The connecting elements are made from a high temperature, high pressure synthetic rubber hose with double cord reinforcements. The hose ends are fitted with double flare fittings. The hoses are of sufficient length to be adaptable to all models in all series. Condenser and Receiver-Dehydrator. The condenser is mounted ahead of the radiator. The receiver-dehydrator tank is attached directly to the right side of the condenser frame along with a horn mounting pad. A sight glass is located in the liquid line from the receiver dehydrator, immediately behind the right radiator side baffle. Thermostatic Expansion Valve. The expansion valve is located at the bottom of the evaporator core on the outside of the case. The liquid enters the valve at the 3/8″ flare fitting, passes through the needle seat orifice, and leaves the valve at the %”flare connection and enters the evaporator. See figure 11-18. The power element or bellows cap of the valve is connected by a capillary line to a thermo bulb which is clamped on the low pressure line between the evaporator coil and the low pressure line muffler. Evaporator and Blower. The evaporator core measures approximately 10″x10″x3″ thick and consists of an aluminum brazed plate type coil. This coil is housed in a plastic impregnated fibre glass (Formadall) case which is mounted to the dash panel on the right side in the engine compartment, replacing the right hand ventilation air duct cover. 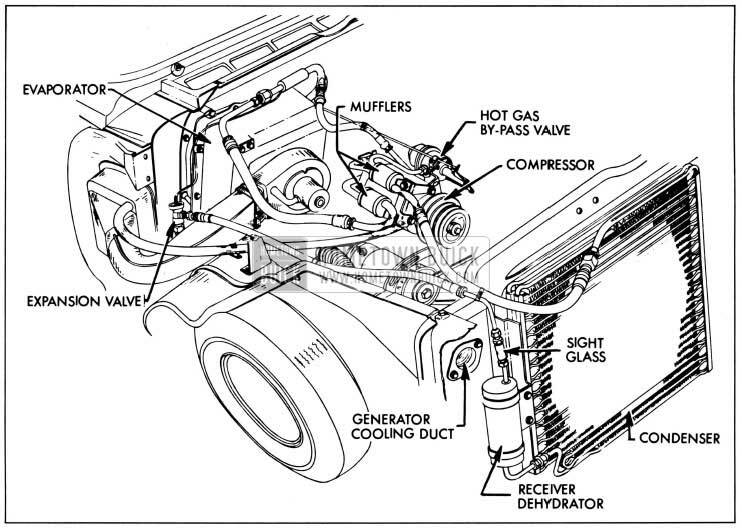 The 1958 Buick blower assembly mounts directly to the evaporator housing, on the front side, and is connected to the outer heater core housing by a large insulated air tube. Hot Gas By-pass Valve. Figure 11-19 is a schematic view of the operating refrigeration cycle using the hot gas by-pass valve and showing this valve’s relative position in the system. The manually controlled hot gas by-pass valve is connected to the evaporator to compressor suction line near the evaporator outlet. It is also connected to the compressor high pressure (discharge) line between the compressor and the condenser. The temperature of air coming out of the evaporator may be controlled between approximately 43° and 60° by varying the air conditioner temperature control lever which is connected to this valve. 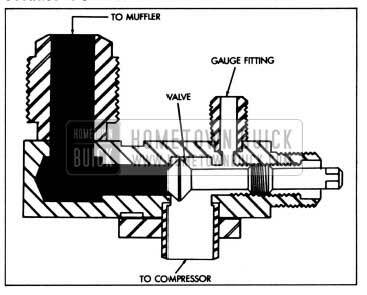 The valve accomplishes this temperature control by metering hot high pressure Freon from the compressor discharge line into the low pressure (suction) line near the evaporator outlet. By this metering the valve maintains any pre-determined minimum evaporator outlet (Freon) pressure between approximately 23 and 55 psi. The pressure regulation in turn affects the thermostatic expansion valve which varies the metering of liquid Freon into the evaporator coil. As the cooling of the air passing through the evaporator coil depends directly upon the quantity of liquid Freon that is allowed to expand (evaporate) in the coil, the conditioned air temperature is effectively controlled. The operating pressure of the hot gas bypass valve is set by means of the adjusting screw which compresses the pilot valve spring. See figure 11-20. 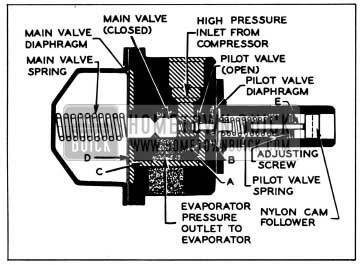 This spring pressure is opposed by the evaporator pressure acting on the pilot valve diaphragm through passage “A”. Using 24 psi as the desired evaporator pressure which will prevent freezing, the following takes place: as long as conditions are such that the evaporator pressure is more than 24 psi, the pressure in Area “B” opposes the pilot valve spring and the unit is sealed and has no effect on the system. When the evaporator pressure drops to the 24 psi setting, the pilot valve spring opens the pilot valve allowing gas at head pressure to pass through passage “C” and apply against the main valve diaphragm in Area “D” which compresses the main valve spring and moves the main valve from its seat permitting gas to pass through to the suction line. These valves position so as to permit enough flow of hot gas to maintain the 24 psi setting. This setting has been referred to as “freeze protection.” If a higher temperature is desired, or less cooling, the pilot valve spring is compressed further than “freeze protection” by means of a Bowden wire and lever acting on pin “E”. Then the same “metering” cycle takes place but at a higher pressure and, consequently, higher temperature. Air Distribution System. The 1958 Buick air conditioner air distribution system makes use of the heater air ducts and outlets at the outer ends of the instrument panel plus an additional outlet located at the rear edge of the instrument panel. The outlets on either end of instrument panel are adjustable. They may be adjusted to direct air up, down, inward toward the center of the car, or outward toward the door panels. Heated or air conditioned air is circulated to the rear seat area when the instrument panel outlets are adjusted so that air is directed along the door panels. See figure 11-21. As both the 1958 Buick air conditioning and heater-defroster systems are dash-mounted it is possible (on cars so equipped) to operate both systems simultaneously to effect dehumidification of the ventilation air when neither heating nor cooling are required. When the air conditioning system is in use the right air vent (under the instrument panel) is converted to a return air duct to provide the evaporator blower with cooled air to recirculate. This results in lower car temperatures than are possible with systems using 100% outside air. Outside air is used exclusively for heating when an air conditioner is not installed. Recirculated air, along with outside air (25%) is used when an air conditioner is installed. A fixed orifice in the evaporator case proportions the outside air to total air that is to be air conditioned. The right outside air vent valve is automatically opened to allow recirculation when the air conditioning unit is operating. A spring loaded pressure relief valve in the right outside air vent valve is necessary to prevent cold air from entering the car when the 1958 Buick heater blower is off. This valve is used only when air conditioning unit is installed, permitting air to recirculate and enter the heating core when the 1958 Buick heater blower is on. The left lever (1) shown in figure 11-22 is the cold range control lever. Maximum cooling position is at the bottom and moving this lever through its full range from bottom to top controls the outlet air temperature from approximately 43° to 60°. “OFF” position on this lever does not turn the air conditioner off. The center lever (2) controls the positioning of the air valves in the 1958 Buick heater defroster inner housing, the right fresh air vent and in the heater air distribution duct. It also controls the air conditioner clutch switch at the right end of its travel (“ON” position). When this lever is in the “OFF” position all valves except the distribution duct valve are closed. As the lever is rotated clockwise to “DEF” position the defroster valve opens; as lever is rotated further clockwise to “HEAT” position the defroster valve closes as the heater valve opens. Rotating the valve to the extreme right (“ON” position) closes the distribution duct valve and opens the right vent valve-the heater valve remains open and the defroster valve remains closed. The air conditioner clutch coil and blower motor are energized just before the lever reaches the full “ON” position. The blower control knob (3) controls the blower switch. This is a 3 position (high-off-low) rotary switch that controls the blower speed. However, the wiring of the compressor clutch coil switch and the blower motor switch is so arranged that when the compressor coil is energized, current is also supplied to the blower motor through the “LO” speed resistor regardless of blower switch position. See Figure 11-39. 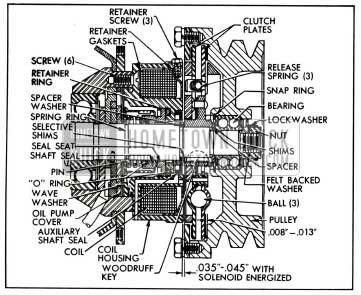 Thus the blower is always in operation when the compressor clutch coil is energized, and can be operated at either “Hi” or “Lo” speed but cannot be shut off until the compressor is shut off. The right lever (4) is the heater temperature control which is connected to the Ranco valve by a Bowden wire. Moving the lever from “OFF” position at the top to “MAX” at the bottom increases the 1958 Buick heater-defroster core temperature within the limits of engine heat. “OFF” position closes the Ranco valve mechanically and stops the flow of coolant through the heater-defroster core. 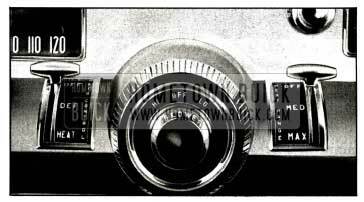 Make certain that the left fresh air vent is closed and that the 1958 Buick heater temperature control (Ranco valve) lever is in the extreme upper (“OFF”) position. Rotate center lever full clockwise to “AIR COND-ON” position. Start engine and adjust cold range lever, blower speed switch and the three outlets as desired to control temperature and air circulation. NOTE: The wiring to the compressor clutch coil is so arranged that during cranking a normally closed relay disengages the compressor clutch, thus eliminating the necessity of turning off the air conditioner while starting the engine. See figure 11-39. For maximum air conditioner performance all windows and ventilators must be closed. If dehumidification is required without cooling move the right control lever down until the desired temperature is obtained. This must be done with the air conditioner in operation as described in steps 2 and 3 above. Dehumidification consists of cooling the incoming air (which removes most of the moisture) then re-heating to the desired comfort level. Hot gas by-pass Control Adjustment. To adjust the temperature control linkage, set the temperature control (left hand) lever on the lower roll of the control panel to “Max.”. Disconnect Bowden wire loop from pin on lever of hot gas by-pass valve. Push lever on bypass valve all the way toward the dash and release slowly. Lever will stop in “Max.” cooling position. Adjust Bowden wire sheave so loop matches position of pin on lever. Clamp Bowden sheave in position with loop encircling pin and replace spring grip washer. Disconnect the valve control wire. Remove valve control lever, counterbalance spring and nylon cam follower. Connect service (high and low pressure) gauges to compressor. Close gage set valves and open compressor valves to gage position. Set engine speed at 1600 RPM, turn unit on and allow time for stabilization. Turn adjusting screw in or out to obtain proper 23-25 lb. reading on the suction (low) pressure gauge. Return compressor valves to running position and remove gauges, replace protective caps, cam follower, control pin, lever and spring and then re-adjust and connect control wire as outlined above. Thermostatic Expansion Valve. The thermostatic expansion valve is of the pre-set nonadjustable type. If detailed diagnosis proves this valve bad, it must be replaced. Both 1958 Buick heater and defroster air valves should be .closed. Right fresh air vent should be closed. Center heater distribution duct valve should be open. Defroster valve should be closed and heater valve wide open. Right fresh air vent valve should be open. Center heater distribution duct valve closed. Air conditioner clutch control switch should be closed. 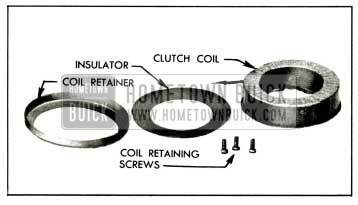 (Energizing clutch coil). 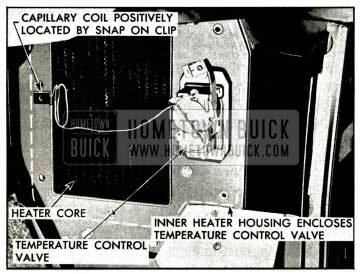 For adjustment of 1958 Buick heater temperature control wire refer to par. 11-6, subpar. e. See Figure 11-23 for details. NOTE: Before the engine is raised or lowered for any service operation the high and low pressure valves with lines attached must be disconnected from compressor, as described in subparagraph a, steps 1 through 8. CAUTION: Observe precautions in handling Freon-12 outlined in 1958 Buick Air Conditioning Manuals. Remove protective caps from gauge fittings of high and low pressure valves on rear end of compressor. Connect charging lines of Pressure Gauge Set (fig. 11-24) to gauge fittings of both valves, with both valves of Manifold J 5415 closed. Remove protective caps and firmly shut off both valves on rear of compressor by turning valve stem clockwise. See figure 11-25. Open valves on Manifold J 5415 to discharge all pressure from compressor. Remove the bolts and lock washers which retain the muffler bracket to the compressor head flange. Remove retaining bolt and lock washer to remove valve retaining plate from rear end of compressor. It may be necessary to spring the pipes slightly to clear the pilots on the valve assemblies. Cover the openings in valves and compressor with tape to exclude dirt. Disconnect clutch solenoid wire, then loosen the belt and remove compressor from its mounting on engine. Do not place compressor in sun or near heat because it still contains some Freon-12. Install compressor by reversing procedure for removal, paying attention to the following points. Inspect drive belts and pulley grooves for conditions that might cause slippage. If a belt is cracked, frayed, or oil soaked, or is worn so that it bottoms in pulley grooves, replace both belts. Belts are furnished in matched sets only, to insure even tension. Adjust drive belts to 1/2″ deflection midway between fan and compressor pulleys. Use new „O“ rings when attaching valve assemblies to compressor. Before starting compressor make sure that both valves are fully opened to running position. After operating compressor for ten minutes at 1750 RPM, leak test around the valve retaining plate. Observing the precautions on handling Freon, remove compressor as per instructions contained in preceding paragraph, and transfer compressor to work bench. If service work is to be done on the car, see subpar. d.
Bend the tangs on the shaft lock washer to clear the flats on the shaft mounting nut. 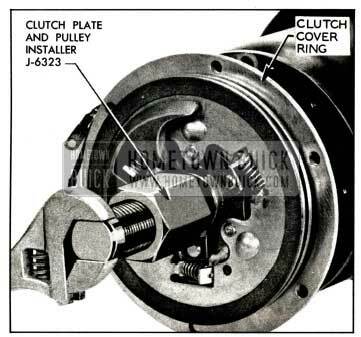 Loosen the six screws in the clutch cover ring. Energize the clutch coil from a 12 volt D.C. source to hold the compressor shaft and clutch assembly. Remove the nut and metal-felt washer. Remove the six screws and lock washers used to mount the clutch cover ring to the pulley casting. NOTE: It is absolutely necessary that this be done at this time to avoid damage to the internal parts of the clutch. It is also necessary to remove the three coil retaining screws to allow the clutch cover plate to move back. Remove the pulley and ball bearing assembly with Compressor Pulley Puller J-6351. NOTE: The I. D. of the ball bearing has a .0001″ to .0006″ press fit onto the first step of the compressor shaft. 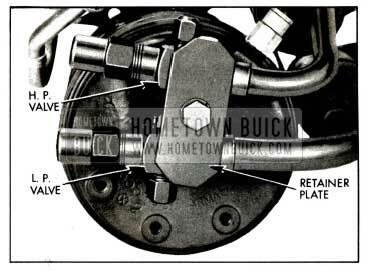 Remove the hub to pulley bearing spacer washer and shims and set aside. The clutch hub to bearing spacer washer and shims may be re-used on the assembly providing the original parts are being re-assembled. However, if it is necessary to replace either clutch plates, pulley, bearing, or if parts are being assembled on a service replacement compressor, a different combination of spacing shims may be required. This shimming is necessary to obtain the .008 to .013 clearance between the friction material on the clutch plate and pulley face, in the disengaged position. NOTE: This clearance must be obtained before the clutch assembly and the pulley are pressed onto the shaft. Place the pulley and bearing assembly on a flat surface of the work bench. A combination of the shims listed here when used with the bearing spacer washer #5918343 (.088 +/- .002) will provide the .008 to .013 clearance. Select any suitable combination for trial use, and place these shims on the inner race of the ball bearing, then place the bearing spacer #5918342 on the shims. Now place the clutch plate assembly in the pulley, so that the hub is in contact with the spacer and shims. Press down firmly at the center of the hub. Rotate the clutch plate assembly. If a very slight “drag” of the friction material is noticed, this will indicate that an insufficient thickness of shims is present in the assembly. Select a different combination and repeat check. If a heavy “drag” is felt, thicker shims must be selected in order to secure the very slight “drag.” If no “drag” at all is felt, thinner shims should be selected, to obtain the very slight “drag.” When this condition is obtained, determine the total thickness of the shims now assembled. Either add an additional .010 shim or replace one of the shims with a .010 thicker shim. This will be the correct spacer and shim combination to complete the assembly to the compressor. After the clutch assembly is pressed on the shaft, place the thick spacer on first and then the correct thinner shims. This will prevent the shims dropping into the undercut near the shaft shoulder. Examine the O.D. of the shaft and the J.D. of the ball bearing for any evidence of wear, scoring or pitting (fretting corrosion). Replace ball bearing in pulley casting if necessary. To replace the ball bearing, remove the Truarc retaining ring, using Truarc pliers #3. Press out the ball bearing from the pulley and replace by pressing in a new bearing. NOTE: It is important upon reassembly to have the beveled side of the snap ring to the outside, or away from the ball bearing. The clutch plate assembly can now be removed by screwing on the special Clutch Plate Puller nut into which the Clutch Plate Puller screw has been assembled. (Tool J-6322). The cone point of this screw will center in the end of the compressor shaft. 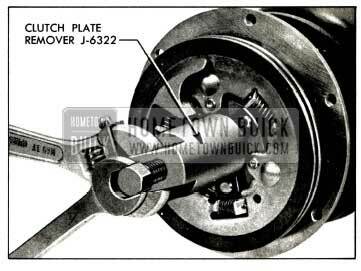 Rotate the screw with a wrench until the clutch plate assembly is pulled off of the shaft and woodruff key. Remove the woodruff key and air gap adjusting shims and spacer washer. 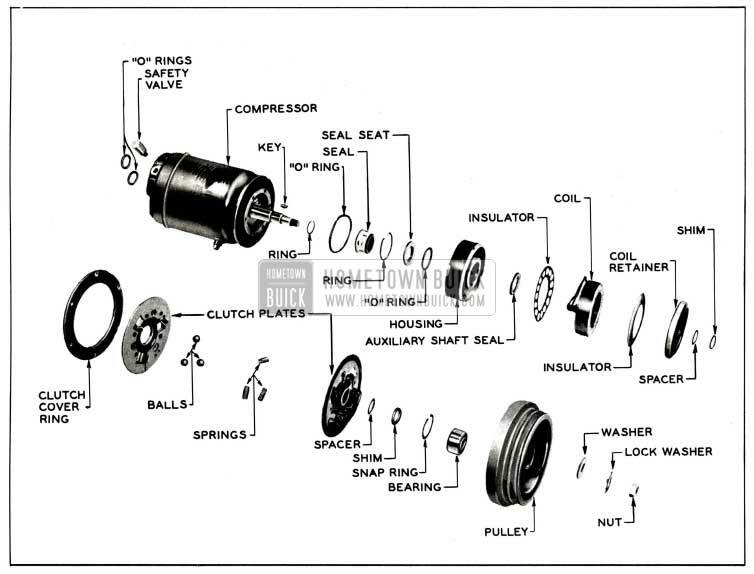 Retain these parts for re-use, if the same clutch pulley parts are being reassembled. If clutch pulley parts are being transferred to a service replacement compressor, a different combination of shims may be required to obtain the .035″ to .045″ air gap between armature and coil housing when coil is energized by 12 volts D.C. 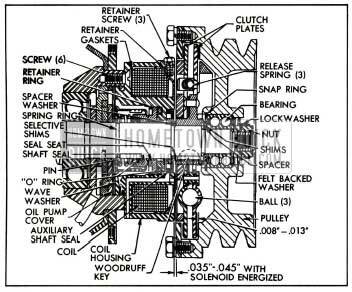 The service replacement compressor clutch will have sufficient number of various thickness shims to obtain the correct air gap. Disassemble the actuating springs from the clutch plates. Examine the frictional surfaces for wear. Replace plate assemblies as necessary. Wipe plates with a clean, dry, oil free cloth. CAUTION: Do not use any cleaning solvents on the frictional surfaces, as it will result in unsatisfactory operation of the clutch upon reassembly. Examine the nylon balls that actuate the clutch. If any of the balls are deformed, excessively worn or damaged, replace all three. Install the three coil retaining screws, place the clutch cover ring against the coil and seal housing. Install the clutch spacer and air gap control shims on the shaft against the shoulder. Replace the woodruff key, tapping it lightly to seat and properly align it. Reassemble the nylon balls and clutch plate springs to complete the assembly of the clutch plates. Align the key slot of the clutch hub with the woodruff key in the shaft of the compressor. Make very certain that this alignment is maintained during the next four steps. The clutch plate assembly is now ready to be pressed on the shaft, using Tool J-6323. See figure 11-32. Screw the threaded stud into the adapter. Screw the adapter and stud on the threaded end of the compressor shaft, to its full travel. Apply a wrench to the hexagonal faces of the adapter. (NOTE: The adapter and stud have a LEFT hand thread.) Turn the adapter off the stud. Hold the stud with a wrench and continue turning until the clutch plate assembly is pressed onto the shaft and woodruff key, making certain that the clutch cover ring does not get caught between the coil housing and the rear clutch plate. Remove the assembly tool. Replace the clutch hub and pulley bearing washer and shims on the compressor shaft, observing instructions in step 4 to obtain proper clutch clearance. Place the “free” washer of Tool J-6323 over the small end of the stud so that the small diameter of the washer will contact the inner race of the bearing. NOTE: This is important to prevent distorting or damaging the ball bearing, the grease seals, and prevent brinelling of the ball bearing. Screw the stud onto the threaded end of the compressor shaft. Turn the adapter with a wrench until the bearing and pulley assembly has been firmly pressed onto the shaft and into proper position. Remove assembly tool. Assemble felt and metal washer. Since the tabs on the shaft lock washer will be deformed from bending at the time of assembly and during the service removal, a new lock washer should be used. Assemble shaft nut, tighten to 5-7 lbs. torque and bend up tabs on lockwasher. Assemble clutch cover ring, screws and lockwashers. Tighten to 2 ft. lbs. (24 in. lbs.) torque. Energize clutch coil with 12 volts D.C.
Use a non-magnetic feeler gauge (J-7151) and check the air gap between the armature and coil housing. It should be between .035″ and .045″. Adjust with correct shims until it is obtained. Replace assembly on car. Following instructions contained in preceeding steps 1 through 9 remove pulley and clutch. Disconnect the electrical leads of the coil from the terminal clip and ground screw. Remove the three coil retaining screws from the seal and coil housing. Remove coil retainer and insulating gasket. Carefully insert a thin screwdriver or other suitable tool through wire opening in rear of coil housing and pry coil forward to remove coil from coil and seal housing. Remove the inner insulating gasket and six housing mounting screws. Remove coil and seal housing from compressor flange. Remove seal seat retainer ring. Remove seal seat and „O“ ring from behind it. Remove the large diameter „O“ ring from the outer flange of the seal-coil housing. Remove the shaft seal assembly. Make certain the seal drive pin and retainer ring remain in place on the shaft. Remove the auxiliary shaft seal from the seal housing. The service replacement shaft seal assembly is supplied in a unit package. It contains the shaft seal, and seal seat, pin and retainer ring, and „O“ rings and auxiliary shaft seal, wiping tissues and packing list. The old „O“ rings removed from the compressor should be discarded and replaced with the fresh ones contained in the unit package. The shaft seal having the carbon block face and the polished metal seal seat should be handled very carefully to avoid damage to the fine finishes on their surfaces. When the seal seat retainer ring is replaced, use care not to scratch or mar the polished surface. Even when the seal surfaces are coated with oil, use care not to contact the seal surfaces with any metallic object, such as tip of oil can, rod, screw driver etc. The lint-free tissues included in the replacement unit package should be used for the final cleaning of the shaft, seal cavity and parts. The seal cavity in the coil housing and around the auxiliary seal should be flooded with clean, fresh Frigidaire 525 viscosity oil prior to assembly. This oil should be taken out of the glass container, in which it is supplied. It is the same oil that is used in the compressor. No other oil should be used for this purpose. Coat all „O“ rings, seal faces and parts with this oil. The shaft seal has an „O“ ring on the inside of it and will contact the O.D. of the compressor shaft when assembled. It must be protected when it is being placed over the shaft. To do this, place the shaft „O“ ring pilot bushing, J-6320, over the shaft against the second step. Apply a light coating of oil to the surface before sliding the seal and „O“ ring in place. The auxiliary seal has a coating on the outer surface to effect a seal with the coil and seal housing when it is pressed into the coil housing. The inner flexible seal has a “V” shaped edge and is provided with a ring-shaped spring to apply the necessary sealing pressure to the shaft. The inner lip of the auxiliary seal should be given a heavy coating of Frigidaire compressor oil and the space between the seal seat and the auxiliary seal in the coil housing should be flooded with the same oil. Assemble the special pilot bushing, J-6320, into the auxiliary seal before assembling the coil and seal housing over the compressor shaft and to the compressor flange. Use care during this operation and also when removing the pilot bushing so as not to disturb the spring behind the “V” lip of the auxiliary seal. The inner lip of the auxiliary seal should be given a heavy coating of oil prior to assembly into the housing. Carefully slide housing over shaft to compressor body, making certain that the small oil drain-back passage „O“ ring is not dislodged. After the housing has been placed over the shaft and the „O“ ring end assembled to the compressor flange, install the six mounting screws. The compressor seal should now be given a Freon-12 leak test to be sure the assembly has been properly made and is leak-tight prior to reassembly on the car. It is suggested that a bar of metal similar to the service compressor shipping plate be made up for a cover plate over the suction and discharge openings. Drill and tap plate in the area that will cover the suction or low pressure opening for either 1/8″ or 1/4″ pipe thread and screw in a 1/8″ pipe to a 1/4″ flare or 1/4″ pipe to 1/4″ flare fitting and use two „O“ rings and the plate mounting bolt to seal the opening. Connect a drum of Freon-12 to the fitting with a charging hose or copper line, which will pressurize the interior of the compressor and the compressor shaft seal. Leak test with leak detecting torch, around the shaft, seal, auxiliary seal and large diameter „O“ ring in the seal housing and the compressor flange. Correct any leaks that may be found and proceed with reassembly of parts. Assemble the inner insulator, actuating coil, outer insulator, coil retainer and the three screws in the coil housing. The coil leads should be sealed with the sealing compound that was removed from the opening in the coil-seal housing. The compressor is now ready to be replaced on the engine mounting brackets. Connect the suction-discharge valve assembly to the compressor using new „O“ rings from stock. Proceed to evacuate or purge the air from the compressor, in accordance with instructions in par. 11-9. Operate the engine and air conditioning system and check operation. Position the valves on the compressor properly for normal operation. Cap the test gauge fittings and replace the caps on the valve stem end, making certain the copper gaskets are in place. Preparation for Removing Compressor Shaft Seal. With engine at low idle (550 RPM) and gauge set attached, close low pressure compressor shut-off (service) valve (shut off position) and energize clutch coil (turn unit on). When low gauge reading reaches “0” turn engine and air conditioner switches off and close high pressure compressor (service) valve (shut-off position). Loosen generator mounting bolts to relax belts; then remove belts from compressor pulley. Preparation for Removing Compressor Clutch Only. When just the pulley and clutch and/or clutch coil are to be removed, only step c of the preceding section need be observed. A stud fitting is welded into the compressor shell at the forward end, just behind mounting ring. The fitting is placed 43 degrees to the side of the vertical centerline. It is threaded on the inside to receive a screw that has a hole drilled in the center. Another hole is drilled at right angles to the center hole, and is just under the screw head. A copper gasket is used to seal the head to the stud. The end of the stud and screw project through the shell and the opening into the screw is at the 4 ounce oil level. The production compressor was originally charged with 16 ounces of 525 viscosity Frigidaire oil. If an unknown quantity of oil has been lost through accident, or a leak of Freon and oil at any of the fittings has occurred, it is advisable to check the oil supply in the compressor. Operate the engine at slow idle for 5 to 7 minutes with the air conditioning system turned on and the blower operating in High. Stop the engine and compressor. Loosen the screw in the oil test fitting and allow a slight seepage of oil to escape. Then retighten the screw for a moment, then “crack” open slightly again. If a steady flow of oil is evident, the oil level is either at the safe minimum level of 4 ounces, or the compressor contains oil in excess of this, and could be a full oil charge up to 16 ounces. NOTE: A service replacement compressor contains 16 ounces of 525 viscosity oil. When the oil test screw was “cracked” open the second time and there was no oil escaping or a hissing or vapor only was evident, this indicates that the oil is below the safe minimum level and oil should be added to the compressor as per following instructions. Attach a gauge set to the proper connections on the compressor. Follow previous instructions on precautions about purging air from all gauge lines, prior to operating the engine and compressor. 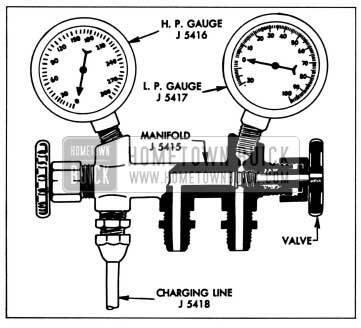 Close the low pressure valve on the compressor (shut-off position) and close both high and low pressure hand shut-off valves on gage manifold. Operate the engine at a slow idle until 10 to 20 inches of vacuum is obtained. Connect a charging line and copper tube to the center connection on the gauge manifold and insert the copper tube to the bottom of the oil bottle. Slowly open the high pressure hand shutoff valve on the gauge manifold. This will permit high pressure vapor to purge the air from the charging line and copper tube and bubble it slowly through the oil. Close hand shutoff valve on gauge manifold and also close the high pressure valve on the compressor (shutoff position). Open the low side hand shutoff on the gauge manifold. This will cause the oil in the bottle to be drawn into the low side of the compressor. Add oil in two ounce increments until sufficient oil has been added to the compressor to produce a satisfactory level when checked at the test screw. Return both high and low pressure valves on the compressor to running position. Attach gauge lines and vacuum pump set-up as shown in figure 11-37. Turn both high and low pressure valves on compressor clockwise to gage position. Start the vacuum pump, open both valves on gauge set, then slowly open the shut off valve on the vacuum pump. CAUTION: If valve on the vacuum pump is opened too quickly, oil may be forced out of pump. Operate vacuum pump until at least 26″ vacuum (at sea level) is registered on the “Low” pressure gauge, then continue to run pump for ten minutes. If a 26″ vacuum cannot be obtained, close pump shut off valve and stop pump, then open the Freon 12 cylinder valve to charge the system at cylinder pressure. After closing the cylinder valve, leak test the complete system including gauge connections and correct any leaks found. After 26″ vacuum has been maintained for ten minutes, close the vacuum pump shutoff valve, stop the pump, and charge the system with Freon 12 at cylinder pressure. With Freon 12 cylinder valve closed, again evacuate the system with pump at 26″ of vacuum for ten minutes. This charging and second evacuation is for the purpose of removing any air or moisture that may have entered the system. After maintaining the 26″ vacuum for ten minutes close the vacuum pump shut-off valve and stop the pump. The refrigerating system is now ready for charging. CAUTION: The foregoing steps for hooking up gauge lines should be followed whenever evacuating or charging the system. Firmly back-seating the (service) shut-off valves (First Par.) will prevent escape of Freon when the smaller protective caps are removed from the rear end of compressor. In cases where it becomes necessary ‘ to evacuate the Air Conditioner and it is impossible to obtain the proper pump for this evacuation, the following procedure may be followed. 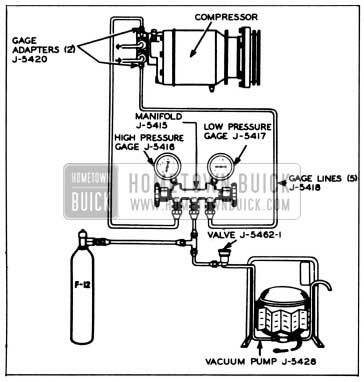 Hook up gauges, lines and Freon 12 Cylinder as shown in Figure 11-37, but substitute a bottle or other suitable container in place of the vacuum pump. The container is to catch the evacuated oil so it may be measured and a like amount of clean oil replaced. Be sure that the fitting on the discharge valve is open to the compressor with no restriction from valve closures, caps, or plugs in the attached line before starting the engine. Turn both high and low pressure valves on compressor clockwise to gauge position. Leaving low pressure gauge valve tightly closed, carefully open the high pressure gauge valve and hand shut-off valve (vacuum line valve), being careful to avoid any accidental discharge of liquid Freon 12. Discharge Freon, air, and any oil into bottle. Start engine and set at low idle (550 rpm) and turn Air Conditioner Blower switch on “Hi” and “Max.” cooling. Maintain engine speed at slow idle at all times during evacuation. Turn high pressure service valve to shutoff position. Operate system at low idle for 5 minutes then turn off engine and air conditioner and close hand shut-off valve immediately. If system holds 25″ vacuum for 10 minutes, proceed to Step 6; if not, locate and correct leak and repeat steps 2, 3, 4 and 5. Close high pressure gauge valve, open low pressure gauge valve, and charge system with Freon at cylinder pressure. Then evacuate again as in steps 1, 2, 3, 4 and 5 for 5 minutes. Again close high pressure gauge valve, and open low pressure gauge valve and then complete charging with 5 lbs. of Freon. Turn both high and low pressure valves on compressor counterclockwise to running position. Following the procedure outlined, replace an amount of clean (Frigidaire 525 viscosity) compressor oil equal to that discharged in steps 3, 4 and 5. Then perform oil level check. Remove gauge lines and oil charging lines, cap the fittings, and check the performance of the unit. CAUTION: Under no circumstances should it be assumed that the foregoing procedure will remove water from the system. Where a leak has occurred and there is a possibility that the system has been operated in a discharged condition, it is essential that the dehydrator be changed. With the vacuum pump, Freon-12 cylinder and gauge set connected to the compressor as shown in Figure 11-37, place the cylinder in a bucket of hot water which does not exceed 125° F.
CAUTION: Do not heat Freon-12 cylinder above 125° F. because the fusible safety plug in cylinder valve melts at 157° F and softens at a slightly lower temperature. Place cylinder and bucket on a suitable scale and record the total weight. Set both high and low pressure service valves on compressor in gauge position. Wearing goggles to protect eyes, fully open the Freon-12 cylinder valve and allow Freon-12 vapor to flow into the refrigerating system. Operate engine and compressor at slow idling speed until a total of 5 pounds of Freon-12 have been charged into the system. NOTE: It may be necessary to reheat the water in bucket to maintain required pressure. Close both valves on gauge set, close valve on Freon-12 cylinder, and remove cylinder from bucket of water. Operate the compressor with engine running at 1600 RPM (using tachometer) and observe general performance of Air Conditioner. If performance is satisfactory, stop the engine. With engine off, firmly back-seat both high and low shut-off (service) valves on compressor to running position, then remove gauge lines. Replace protective caps over gauge connectors and shut-off valves, then tighten securely. Check oil level in compressor as described in paragraph 11-8 (e). Car doors and hood open. Blower at “Hi” speed. .
Gage set connected and compressor service valves in “gage” position with gage set valves shut off. Set engine speed at 1600 RPM. The table below lists ambient temperature, suction pressures and right air outlet temperatures that can be expected from a normally functioning unit. NOTE: If suction pressure is not correct for indicated ambient temperature, adjust hot gas by-pass valve with re-worked screwdriver CYs” wide notch cut Ys” deep in end of blade). NOTE: The lower suction pressure and outlet temperature can be achieved on extremely dry days and the higher on humid days. A further test to be made on jobs which will pass test #1 but do not perform in a satisfactory manner on the road. This test can disclose a malfunctioning compressor or expansion valve. In this test the engine speed is adjusted to the ambient temperature and humidity. The suction pressures and outlet temperatures should be equal to or lower than those given in the above table. Restriction in high pressure system. Defective hot gas by-pass valve.